Having recently had a baby, I have been quickly reminded and yet still astounded by how much laundry such a little person generates. 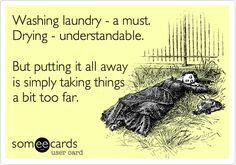 Prior to the birth of little man, it was Mr. B, mini-me and I and we could usually wait until the weekends before doing 1-3 loads of laundry. Even with that amount, I could barely stay on top of folding and putting away but now, well, now we've entered a whole other territory. Since we brought little man home I swear I am doing a load of laundry a day. Little man is a spitter-upper so that's a factor. Then there's the whole 'I like to projectile pee every time you change my bum' thing. Oh, and the breastfed baby poop. I forgot about breastfed baby poop. Not surprising, between caring for little man and attempting to entertain mini-me, the unfolded laundry is mounting (hey, it's clean, so that's gotta count for something). I will catch up one day... who am I kidding? I'm destined to have baskets full of clean, unfolded laundry in my bedroom for life. Use baby-friendly detergent - these wee creatures have crazy soft but sensitive skin so it's best to (at least initially) stick with a detergent free of dyes and tons of chemicals. Most brands have a 'free and clear' line that works well. My favorite detergent for little man's clothes is Rockin' Green. We use the one for hard water but there's a number of options. It smells good, cleans amazing and I've had no issues with sensitivities with either child or Mr. B or I.
Rinse IMMEDIATELY - I cannot stress this enough, especially if we're talking about poop and specifically poop from a breastfed babe. Breastfed baby poop is water soluble so if you rinse right away, you should be okay; however, if you let it sit, you're going to have a shirt (be it yours, or your littles) with a nice yellow stain. Pre-treat stains - if you really can't rinse right away you're going to need to attempt to beat that stain another way. I have OxiClean spray handy in the laundry room. It's a must have. It usually is enough to get the stain out. Sadly though, we've still lost a few cute clothes due to pesky set-in stains. Stain-fight on-the-go - personally, I'm a big fan of the Tide to go stick; however, they add up in price and I've noticed if I use it on white, I sometimes get a lasting yellow stain where I've used the stick. The best and most cost effective way to fight stains while out and about? Make your own to-go stain remover. It's as easy as picking up a spray bottle from the dollar store and mixing 3 parts water to 1 part detergent. Easy peasy. Wash before wear - okay, I'll admit, I didn't know this prior to actually having kids (and googling EVERYthing) but newly purchased clothes come with all kinds of chemicals on them. For the most part, I always wash the kids' clothes prior to them putting them on.